10% Report: Reading the 20th Century – The End – or maybe not ….. I can’t quite believe it but my Century of Books is done. 100 books! 100 authors! 100 posts! I’m am so glad I’ve done it. There are times when I thought the search for books for particular years was going to drive me mad, but it hasn’t – quite – and I have made so many wonderful discoveries along the way. You can see my complete list here. I’m a little light-headed now, as I get used to the gap where the project used to be. It was a push to finish by the end of the year, but I have, and now I can read whatever I want!! There might be another century; it might be the same or it might be different; it might start now or it might start later. I’m still mulling over ideas, and I’ll write about them – and about what I’ve learned from this century – in a day or two. I always wanted to finish with my 20th Century reading project with a significant book, and I found it at the beginning of the year. It’s a book that was written in 1906, but wasn’t published until 1977, when it became a publishing phenomenon. There was the book, there was – and I believe there still is – merchandise. And at the centre of it all was a book that is simple, timeless, and lovely. 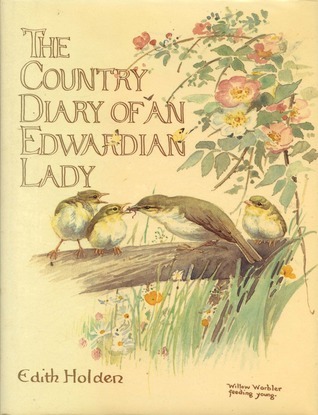 That book is ‘The Country Diary of an Edwardian Lady’ by Edith Holden. And, because it is a diary, I’ve been dipping into it every month, over the course of this year that is nearly past. The copy I’m reading was a gift from my father to my mother, not long after the book was published. 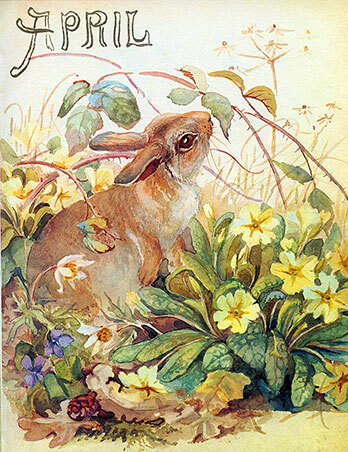 Edith Holden was an artist, an illustrator and a teacher of art. My grandfather – my mother’s father – was all of those things too, and that was another good reason for making this book a part of my century. 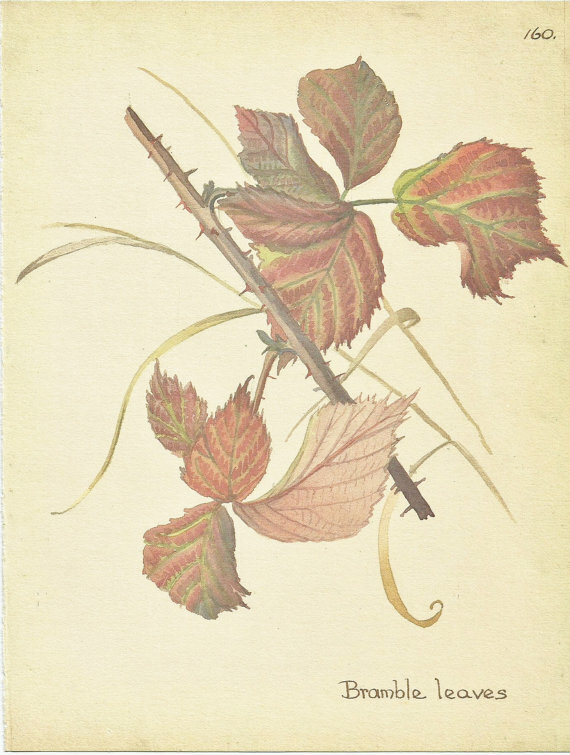 In 1906 Edith compiled nature notes over the course of a year; seasonal observations of the natural world; drawings of plants, animals, birds, insects; and poetry that she loved, that echoed what she saw and what she drew. The book is utterly beautiful. Its pages are facsimiles of Edith’s original, and it holds so much and is so lovely that it would be easy to spend so many hours in its company. But I read one month every month, following Edith’s year is real time, wishing that I could have walked alongside her, or maybe that I could have been one of her students. Each month had a beautiful title page, and it’s hard to pick a favourite, but if I was pressed I would pick April. because I’ve always loved primroses. In May I was smitten with an extended quotation from Tennyson’s ‘The may Queen’, copied out in such neat handwriting. 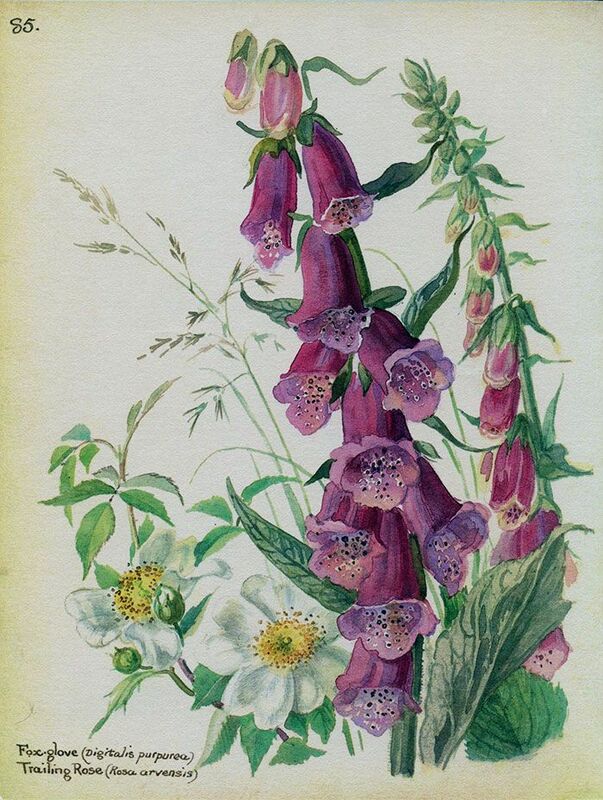 July’s journal had so many images of wild flowers; all were lovely but I think that the loveliest was the foxglove and the trailing rose. Bramble leaves, quite perfectly drawn, caught my eye in December. The origin of the name of the month, and feast days, were always noted, and the book ended with a list of birds spotted and plants observed – in English and in Latin. Edith must have taken such care over this journal; it really is a thing of beauty, capturing the natural world that she so clearly loved quite beautifully. And I suspect that I will be reading through the months of her year again over the years to come. When World War II began Emma Smith was very nearly grown up. She saw young men she knew sign up, she heard news of deaths, she saw other working on the home front, and she wanted to do something too. In 1943 she found her role. 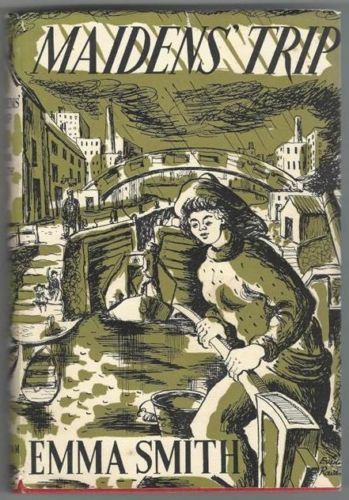 She signed on with the Grand Union Shipping Company, who were employing women to get boats that had been lying idle moving again, to move cargoes up and down the country. I read about those years in Emma Smith’s second volume of autobiography, ‘As Green as Grass.’ It’s a wonderful books, but the Cornish library Service’s copies are in heavy demand, and so I had to hand my copy back before I had time to pull my thoughts together and write about it. But I had this book, the book that Emma Smith wrote about her wartime experiences right after the war, the book that won the James Tait Black Memorial Award for 1948, on the shelf; I had to pick it up and read. ‘Maidens’ Trip’ is fiction, but it is very close to fact; this is the story of one journey, up and down the canal, inspired by many trips made and many people met until the end of the year. It is a wonderful adventure for three young women – Nanette, Emma and Charity – all from conventional, middle-class backgrounds, who have completed basic training and have been dropped into the very different world of the boating fraternity. They will manage two boats – a motor boat to provide the power and a butty boat to provide the space – and they will move cargo between London and Birmingham. Emma Smith paints wonderful pictures of those people: some are curious, some are helpful, some are competitive, and only a few are hostile. The three girls take to their new life with gusto. They live in cramped conditions, rising early, cooking on a camping stove, and go out in all weathers to do hard physical work. They learn much along the way, they laugh, they cry, they squabble; but it is clear that they have a wonderful camaraderie, that they are completely wrapped up in what they are doing, and that they are absolutely determined to succeed. The war, home, family, seem so far away, and are barely mentioned. That’s how caught up they are ….. The workings of the boats, the mechanics of the canal and the boats form the backbone of the story, and though I knew little it was easy to understand, and the spirit of the girls always held my interest. If they could do it then I could read it! There are some wonderful incidents along the way. A kitten is rescued and named Cleopatra. A girl is forced to run along the canal bank when she is left behind, after going in search of proper bathroom facilities. A few tins of food are turned into a wonderful feast. A leak creates panic …..
Emma Smith took all of this – day-to-day minutiae and wonderful memories – and she turned it into a wonderfully engrossing tale. She told it with such verve, such wonderful economy, such subtle wit, such elegant prose; and she brought a world and a time that she clearly loved to life on the page. 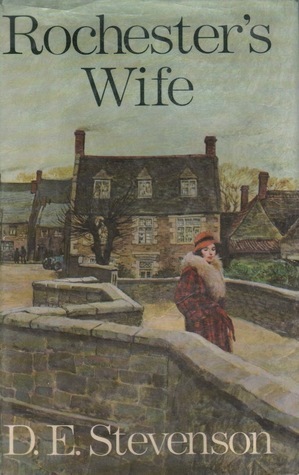 I found this in a bargain bin, I was thrilled to find an out of print book by D E Stevenson, but sadly I was to find that Rochester’s Wife was not D E Stevenson at her best. The story begins with Doctor Kit Stone has returning to England after four years of travelling the world. As a child he had dreamed of being sailor, but he was the son of a widowed doctor who dreamed of seeing one of his sons take over the family practice. But Kit’s father died before he completed his studies, and so the practice was old instead and the proceeds were divided between his two sons. When he qualified, Kit used his legacy to travel, to see the world. Kit was happy to be back in England, but he didn’t feel ready to settle. He let himself be steered though. Kit’s elder brother, Henry, had used his own legacy to advance his career as a stockbroker. One of his partners, Jack Rochester, lived in a small town, not far from London, and he knew that the town doctor was growing old and in need of support. The suggestion was made, first to the doctor and then to Kit, that he join the town practice. The old doctor and the young doctor were both wary, but they soon formed an understanding, and Kit moved into the Peabody household. He and the gruff Doctor Peabody enjoyed working together, and it was clear that the elderly doctor was pleased to have another man in the house. He grew fond of the doctor’s young grandson, the charmingly precocious and eminently likeable Jem, whose parents were abroad; a lovely elder-younger brother relationship grew between the two of them. He was less successful with Miss Peabody, Ethel, the doctor’s unmarried and unhappy daughter; but he got on very well with Dolly, the doctor’s recently married daughter, who came home when her husband had to go abroad, as she was expecting her first child. It seemed that every time a place was mentioned Kit had been there on his travels, and that every time a problem surfaced Kit could call on experiences he’s had abroad. He must have had an extraordinary itinerary; he must have been vigilant, perceptive, and so very receptive … It was highly unlikely, but it would have been forgiveable if the heart of the story had been right. When Kit met the Rochesters he was smitten with Mrs Rochester, who was beautiful, charming, and quietly compassionate. She was lovely, and it was understandable that Kit fell in love with her. But of course there was an impediment: she had a husband, she loved him, and she was loyal to him. And there was another problem: Mr Rochester was clearly unstable, and his wife was struggling to keep things together. Kit believed him to be insane, Doctor Peabody confirmed his diagnosis, and they had to work out what to do, given that they had not been called on in a professional capacity, given that they did not want Mrs Rochester – Mardie – to be upset. The way that this story plays out is too melodramatic, interesting characters are side-lined, and, most of all, its presentation of mental illness is not right – even given that times and ideas have changed. I’m inclined to say that this is a classic case of an author picking a subject that doesn’t suit her, and sticking with it regardless. There are some lovely scenes along the way. It became clear that Mardie cared for Kit as much as he cared for her. Jem – who had a wonderful talent for imitating the people around him – was always a joy. And there was a wonderful trip to Scotland. The story was readable, and was always going to keep reading to find out what happened. The ending was odd, a strange mix of things that were right and things the were wrong, contrived so that everything could be resolved. The resolution was right but the way it was reached was wrong. I could say almost the same thing about the book as a whole. There was the potential for a much more interesting story with the characters, and with their circumstances. And as it stands the story feels unpolished, and it was maddening because with just a little reworking – in particular with the word ‘breakdown’ replacing the word ‘insane’ – I’m sure it could have been so much better. I have to address you, but I must confess that I am very nearly lost for words. I have never met anyone quite like you – in fact or in fiction – and you have made such an impression. You really are a force of nature. You had to be, to have lived the life that you have lived. Looking back it’s hard to believe that you were the daughter of a self-made man, that you came from Apex in North Carolina. But, of course, you were the apple of your parents’ eyes, and they were prepared to invest everything they had, and to do without themselves, to help you reach the very highest echelons of New York society. You always got what you wanted. Always. Did you appreciate what they did for you? Did you understand how much they sacrifice? I think not; there was nothing in your words, your actions, your demeanour to suggest that you did. At first I was inclined to blame your parents for spoiling you, but I came to realise that it wasn’t them, it was you. I began to feel sorry for them. You made some mistakes as you climbed the ladder, because you didn’t quite understand quite how that rarefied society worked, but you were a wonderfully quick learner. You changed your behaviour, your appearance, your expectations, to become the person you wanted to be, the person you needed to be, to achieve your ambitions. And you succeeded. You drew the attention of Ralph Marvell, the son of one of the oldest, grandest families in New York. He loved your beauty, your difference; and you loved everything that he stood for. And so you married ….. Sadly, it wasn’t a happy ending. You didn’t understand that the families at the pinnacle of society were not the wealthiest. You couldn’t understand that Ralph didn’t share your ambitions – I don’t think that you even realised that was possible – and certainly it was quite beyond your comprehension that he dreamed of a writing a novel. He never did, he had not one iota of your drive and ambition, and I suspect that he lacked the talent. Ralph drifted through life, disappointed that he could not expand your narrow horizons, that he could not open your eyes to the beauty of the art and literature that he loved. He was part of an old order that was dying, and you were part of a new order that would adapt and survive. You learned how to bend and even change society’s rules to allow you to do exactly what you wanted to do. You really didn’t understand him, you broke him, and my heart broke for him. I even began to feel at little sorry for you, despite your selfishness, because there was so much that you didn’t understand. There are more important things than money, luxury, fashion, and social position. Things can’t really make you happy, because there will always be other things to want, there will always be things beyond your reach. You learned so much, but you never learned that. There would be more marriages, more travels, more possessions …. There would be more damage. My heart broke again, for the son you so often seemed to forget you had. And though you would never admit it, you were damaged by your own actions. But you were a survivor Undine, weren’t you? You did learn a little; I learned a little about your past, and I came to feel that I understood you a little better; most of all, I do think that when you finally married the right man it made all the difference. It wasn’t quite enough for me to say that I liked you, but I was always fascinated by you. Now I find myself wanting to do what Alice did at the end of ‘Alice’s Adventures in Wonderland. I want to throw you in the air and say, “You’re just a fictional character!” But I can’t. Because you are so utterly real; not a heroine, not a villainess, but a vivid, three-dimensional human being, with strengths and weaknesses. You are perfectly realised; your world and everything, everything around you is perfectly realised. The telling of your story is compelling, beautiful and so very profound. It speaks of its times and it has things to say that are timeless. Because, though times may change, human nature stays the same. 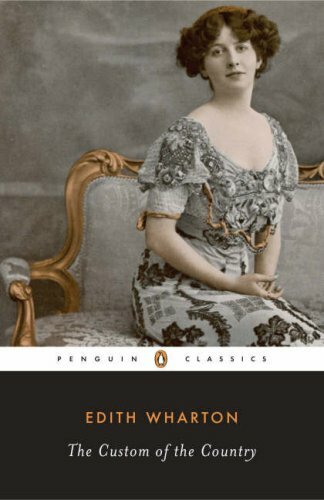 Edith Wharton was a genius – it’s as simple as that. High Rising ….. and then Christmas at High Rising ….. I have had a selection of Angela Thirkell’s books on my shelves for a few years now, but I have been reluctant to read them. Because I knew that they were part of a series, albeit loosely linked, that it seemed would be difficult to collect in its entirety. Because I haven’t read Trollope’s Chronicles of Barchester – despite making a few attempts on the first book in the series – and I know that Angela Thirkell borrowed Trollope’s setting, and there are links and references for lovers of both authors to appreciate. 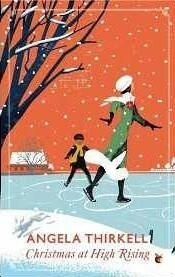 But my resolve weakened when Virago added a couple of Thirkells to the Modern Classics list, and then a couple more, and I believe there are another couple coming in the spring. Suddenly the books seemed more gettable. And I dismissed the Trollope argument. I’ve started the first of his Palliser novels – as a long, slow read – and I’m not prepared to let these lovely new editions sit unread while I work my way through the Palliser novels and then go back for another attempt at the Chronicles of Barchester. After all, there’s always the possibility of re-reading if I fall in love with both. And the final, winning, argument to pick up ‘High Rising’ – Mrs Thirkell’s first Barchester novel – was that it was published in 1933. Both of my parents were born in that year, and so I wanted something special to fill that year in my Century of Books. Now I have read ‘High Rising’ I can say, firmly and clearly that I did the right thing -I loved it! I really can’t think of another author who has mixed charm, wit, cosiness and sparkle to such wonderful effect. The lynch-pin of the story is Laura Morland, the widowed mother of four sons. Three have grown and flown the nest, leaving just young Tony, who is the very model of an enthusiastic, infuriating, schoolboy at home to entertain and frustrate his mother. When her husband died she took up writing middlebrow novels to support her family. She achieved a level of success that left her very comfortably off. I was so taken with Laura; I found her warm-hearted, thoughtful, capable in the very best of ways, but not to much so. She is fallible, she is self-deprecating, and it is so easy to feel that she is a friend. The story comes from an outsider being thrown into – or I really should say elbowing her way into – a settled society in High Rising and the neighbouring Low Rising. There’s Miss Todd, who cares for her elderly mother who is physically and mentally frail, and who makes pin money as Laura’s secretary. There’s Laura’ maid, Stoker, who is loyal, seemingly incurious but actually all knowing There’s George Knox, a successful biographer, a wonderful raconteur, and a dear friend of Laura. There’s his daughter Sibyl, who Laura views as the daughter she never had, and who is smitten with Laura’s publisher, Adrian Coates. As he is with her …. A whole raft of wonderful characters. The outsider is Miss Grey, who becomes secretary to Mr Knox. She is wonderfully capable, she can be charming, but she has set her sights on becoming Mrs Knox, and will use whatever means she can to achieve her objective. Some are fair but most are foul, and George’s friends are quick to label her ‘The Incubus’ and he himself is completely oblivious. It falls to Laura to sort out the problem of Miss Grey, and to bring Sibyl and Adrian together. It’s a simple story, but it plays out beautifully, because it is adorned with so many lovely dialogues, so many interesting incidents; and because everything works beautifully with the characters and their situations. I do so hope that I will meet some of those characters again, in other books in the series. I can’t say that ‘High Rising’ is perfect. 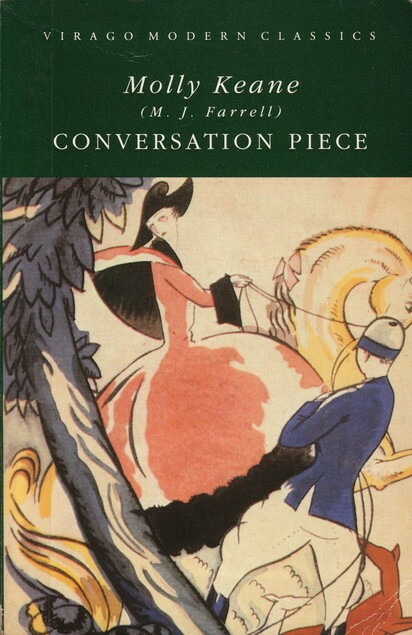 The story is uneven; there are one or two racial references that would have been acceptable then, but not now; and there were one or two moments when I realised that Angela Thirkell could only see the world from the perspective of her own class. 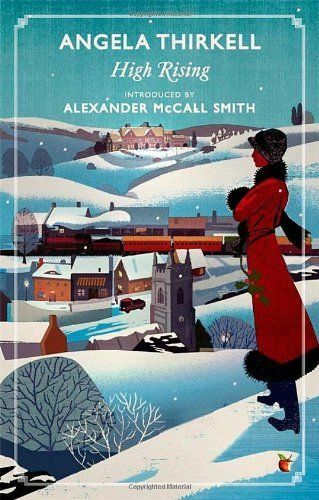 But none of those faults were unforgivable, especially in an early novel, and I am so looking forward to reading more stories set in Barsetshire. It’s a wonderful recipe: charm, wit, cosiness and sparkle! And that’s why I picked up ‘Christmas at High Rising’ this afternoon, when I was stretched out on the sofa, woozy from a visit to the dentist in the morning. It’s a slim volume, containing seven previously uncollected short stories and an essay about dinner parties in Shakespeare’s plays. I read it from cover to cover! It was lovely to reencounter an authorial voice that felt so familiar, and to encounter characters I had already met, and new characters too. I wonder if I will meet them again in stories still to come. I do hope so. The right book is sometimes the best medicine, and this was definitely the right book at the right time.